TEHRAN: Turkish President Tayyip Erdogan called for a ceasefire in the rebel-held region of Idlib in northwest Syria on Friday and said an anticipated government assault on insurgents there could result in a massacre. But Russia’s President Vladimir Putin said Moscow opposed a truce, and Iranian leader Hassan Rouhani said Syria must regain control over all its territory. The three presidents, whose countries’ are key foreign players in Syria’s long civil war, were speaking at a summit in Tehran aimed at charting a way to end the conflict. The situation in Idlib, the insurgent’s only remaining major stronghold, is an immediate issue as President Bashar al-Assad’s forces, backed by Russia and Iran, prepare for what could be the conflict’s last decisive battle. The United Nations has warned an assault could lead to a humanitarian catastrophe. But as the leaders gathered in Tehran, Russian and government warplanes hit rebel-held parts of Idlib, the Syrian Observatory for Human Rights war monitor said. Their discussions in Tehran could mark a turning point in a seven-year-old war which has killed more than half a million people and forced 11 million to flee their homes. 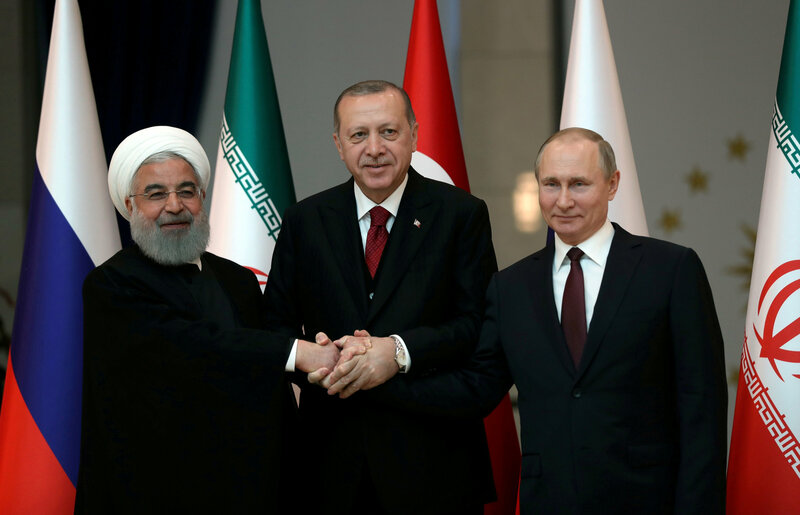 In opening remarks, Erdogan called on Putin and Rouhani to agree to a ceasefire in Idlib, saying such an accord would be a “victory” of their summit. However, Putin responded that he opposed a ceasefire because Nusra Front and Islamic State militants located there were not part of peace talks. Syria should regain control of all its territory, he said. “The fact is that there are no representatives of the armed opposition here around this table. And more still, there are no representatives of Jabhat al-Nusra or ISIS or the Syrian army,” Putin said. Rouhani also said the battle in Syria would continue until militants are pushed out of the whole country, especially in Idlib, but he added that any military operations should avoid harming civilians. Widely abhorred internationality for the brutal conduct of the war, Assad has largely reclaimed most of Syrian territory though much of it is ravaged. As the conflict approaches its endgame, Iran, Turkey and Russia are seeking to safeguard their own interests after investing heavily militarily and diplomatically in Syria.